4:58 GMT – 8:28 Tehran Time – James Miller is signing off, but Enduring America has just started their new liveblog, where readers can find breaking news on Iran. Videos from Tehran reveal that protesters have remained in the streets past nightfall, gathering around garbage bins set on fire and chanting anti-government slogans, Zamaneh reports. The website of Green Voice of Freedom, which has posted videos of today’s gatherings, has become increasingly difficult to access, and MirHosein Mousavi’s Kaleme website also reports heavy interference with its internet service. An eyewitness has told Zamaneh that around 5:30 local time, two young men were shot by anti-riot police and taken to hospital. Official sources have not yet confirmed this report. James Miller (Dissected News): I’ve just finished compiling pictures and videos, with analysis, for the day. There are unconfirmed reports that cell phone service and internet service have been disrupted in Tehran, and there is very little fresh information from the streets right now. We walked down Gharani Avenue from Karim Khan Avenue to reach Ferdowsi Square around 3 p.m. There were only three of us and we made a promise that if others did not show up we would abandon the march altogether. But were we in for a nice surprise. Even before we got to Ferdowsi Square we saw silent groups of people marching randomly with a determination in their eyes. 3:10 pm the guards were everywhere but not like they were in the Ashura demonstrations last year. We reached College Crossway (where Hafez Avenue crosses Enghelab Avenue) and the sidewalks were already filling up with quiet demonstrators without any signs or slogans. By the time we reached Vali Asr Avenue we realized that the tactic of the guards and the militia was to let groups of people go through and then separate them at each crossroad, so we tried to keep together and stay cool. 3:30 pm marked a painful visual landscape for me that I will never forget: the Basijis and the Revolutionary Guards had brought children in the street. They gave them clubs and were directing them for the attack, which happened right at that crossroad. The kids were probably 15 or 16 years old but their eyes were filled with hate. “Good Islamic teaching, right?” I heard an elderly man say in an angry but muffled voice. I called my family to tell them where I was but the phones went dead around 3:45 and this was when the bikes rolled into the sidewalks and started beating people. I was separated from my friends in Enghelab Square but kept on going. The energy of the people and especially of the women and the elderly was like an electrical charge. I could not feel the beatings anymore and the clubs kept on coming on our heads, shoulders, legs, and knees. Right at Jamalzadeh crossing, I heard a cheering crowd and realized that a large group of screaming demonstrators pouring south into Azadi Avenue (the continuation of Enghelab Avenue after Enghelab Square toward Azadi Square is called Azadi Avenue). The guards stopped all of the buses in the middle of the boulevard and forced us into the middle of the street. It was déjà vu as we reached Dampezeshki (Animal Husbandry Hospital). This was the same spot I was badly beaten in a June 2009 post-election demonstration. So I kept myself on the extreme right side of the sidewalk. 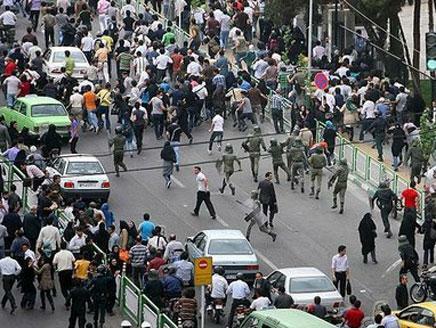 It seems that the Revolutionary Guards were repeating the same tactics again because they rounded up the people in the middle of the street and attacked them the same way they did in 2009. I slipped through the angry-looking guards and plainclothes militia and came across another scene. When I reached Eskandari Street it looked like a war zone: smoke, dust, teargas, screaming people, flying stones, and regular attacks by the well-equipped motorcycle-riding guards. A petite young girl with a green wristband and a small backpack was walking to my left. Just before we reached Navab Avenue the guards charged from behind, one of their clubs hit my left leg but three of them attacked the girl relentlessly. She screamed and fell to the ground, but the guards kept hitting her. I ran towards them, grabbed the girl’s right hand and released her from the grip of the guards. She was in a daze and crying unstoppably. I pushed her north into Navab Avenue towards Tohid Square away from Azadi Avenue when the guards charged towards us. This time the crowd fought back and stones of all sizes were directed back at them. This gave me a bit of time to ask one of the restaurants to open their doors and let us in. The girl was in shock and pain. I got her some water and asked how she was. Her clothes were dusty, her backpack was torn and her hands were shaking. “Why?” she kept asking. The battle in front of the restaurant raged on. The crowd had only their fists and stones gathered from the sides of the street, but the guards were shooting people in the head with paint guns, and spraying pepper gas and shooting teargas canisters. Then in a moment that I thought I would never see, two guards ran up, sat on one foot and randomly fired plastic bullets into the crowd. We waited until the demonstrators pushed the guards back before leaving the restaurant. It was amazing today. About 350,000 people showed up. The crowds came from the sidewalks. There was no chanting on the main avenue. The security forces would try to disperse the crowd once in a while by firing tear gas. People would move to the side streets and start bonfires. It was beyond anything we had expected. They didn’t shut off the mobile phones so word spread quickly [that they were not cracking down hard] before they shut them off around 4 p.m. It seemed like the Basij were ordered not to act until ordered. They just stood around looking bewildered. When the riot police would drive by on their bikes, they just put the fires out. Rarely did they arrest. I saw ten people arrested; this means probably up to 1,000 were arrested. I was all over on foot and on the rapid transit buses. The crowds were EVERYWHERE. They were remarkable for their peacefulness. They filled a radius of about half a kilometer to 400 meters on both sides of Enghelab Avenue. It looks like for the first time people from working class areas were involved too. I left two hours ago but the crowds were still out there. The security presence was large, perhaps 13,000. There may have been some killings. We saw two people beaten to a pulp. The first [beating was administered] by intel ministry officers, the second by Sepah [the Islamic Revolutionary Guards Corps]. Overall people worked hard to stop the beatings of the regime forces. About 200 special forces on bikes drove down on Javan Mard Ghasab, but perhaps they were going back to base [and not necessarily responding to protests there]. Several thousand walked from Imam Hossein Square towards Enghelb Square. This is the first time ever. Imam Hossein Square is working class. Also at Jayhoon, one kilometer south of Enghelab, there were bonfires burning until 8 p.m. 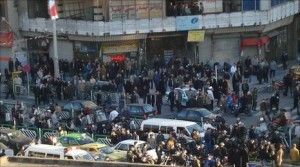 The police had blocked entry of cars westwards at Imam Hossein from 3 to 4 p.m., but people walked on the sidewalks. I saw some 19 personnel carriers at Vanak Square around 9 p.m, plus 20 special motorbikes. An hour ago, 200 people were standing around Mohseni Square, known as Mother Square, in northern Tehran. Overall, the security forces were restrained. Iran Green Voice reports that Grand Ayatollah Sanei has met with families of political prisoners, where he said that the dictatorship that we see today is the worst in Iran’s history. We also have confirmation that at least one person was killed in the protests today. Iranian security forces clashed with protesters as hundreds of thousands marched in Tehran on Monday in the biggest rally by the opposition Green Movement for more than a year. The emphasis is on the “hundreds of thousands” part of this. If even partially true, this is beyond what many analysts expected, and is a clear signal the the movement for freedom, justice, civil and human rights is not only alive, but thriving in Iran. Hillary Clinton has clearly and unambiguously lent her support for the Iranian people. The cautious, ambiguous approach that we saw coming from the administration in 2009, when they were worried about their “delicate” nuclear negotiations with the regime, seems to have been put on the backburner as they are starting to realize that it is time to push the domino. This video shows protesters gathered in another major city (other than Tehran), called Shiraz. At one point you can hear someone say, “lower your heads,” presumably so as not to be easily identified by video cameras or regime operatives. In this video you can see people trying to get away from tear gas fumes as they chant “Death to dictator”. 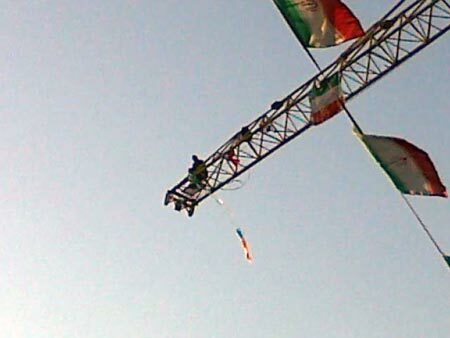 “Iranians with DIGNITY, SUPPORT! SUPPORT!” A call to fellow Iranians to join the protesters. 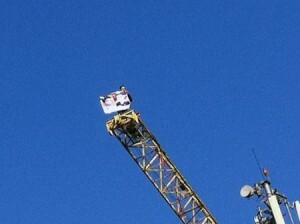 “Zendebad Karroubi!” Long live Karroubi! 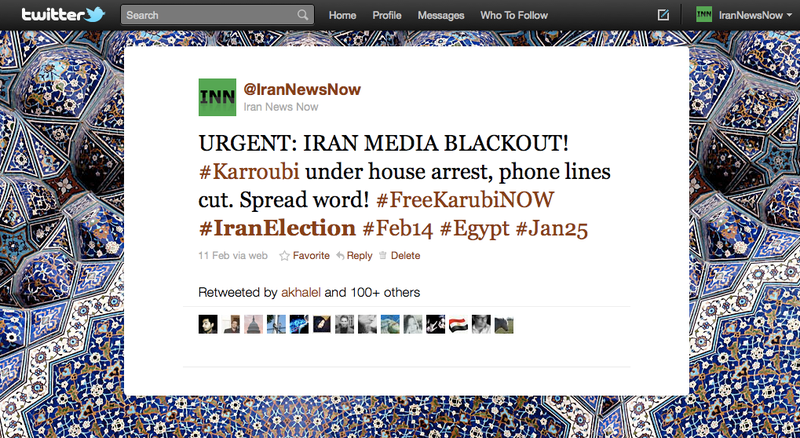 (Karroubi is the opposition leader that has been held under house arrest for the past 4 days). “Death to YOU!” Emphasis on the “you” and in reference to the leaders of the regime. Chants of “I will kill, I will kill, he who killed my brother!”, as a street battle unfolds in Tehran. People cough from what is likely tear gas in the air. People sing “Ey Iran” a very popular song, nationalistic song from before the revolution. The regime does not like it. The names are in reference to Presidents Mubarak of Egypt, Ben Ali from Tunisia (both ousted in popular uprisings), and Seyed Ali (referring to Ayatollah Seyed Ali Khamenei, the current self-titled “Supreme Leader” of Iran). Basically they are saying it’s Khamenei’s turn to leave. Videos have come in fast an furious in last few hours. Iranian police have fired tear gas at opposition demonstrators gathering in central Tehran in support of the protests in Egypt. 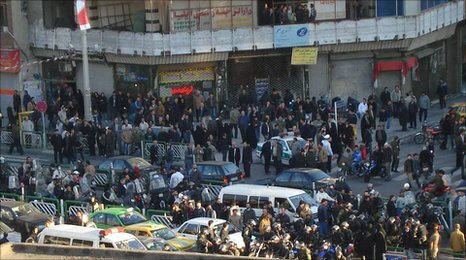 A BBC producer in the Iranian capital, who was affected by the gas, described central Tehran as “total chaos”. He said “severe clashes” were taking place between protesters and police and there had been many arrests. Iranian police have placed opposition leader Mir Hossein Mousavi under house arrest, his official website says. It says the move is intended to block him from attending the rally in Tehran. The BBC’s Mohsen Asgari in Tehran says thousands of people defied the government ban and gathered in the city centre chanting “death to dictators”. Reza Sayah reports chants of “Death to dictator” and clashes in Enghelab Avenue and Imam Hossein square, as well as tear gas used to disperse crowds in Valiasr Intersection. He also reports that tear gas and paint balls have been fired by security forces at Tehran University, where several protesters were taken away on motorcycles. More reports that Mousavi and Rahnavard have joined protesters, but we still don’t have independent confirmation. Reports of some people severely beaten in various clashes. The earlier report from Homy Lafayette that we posted has been clarified. Apparently eavesdropping on police radio frequency, it was heard that 5000 to 6000 protesters were seen by police on the march from Eghelab to Valiasr Square. This is very significant if true. Multiple reports of people being attacked and beaten by security forces in the city of Shiraz. Reports of clashes all over the place in Tehran, with tear gas used in multiple places (still can’t confirm this). Thousands of people are marching silently towards Azadi Square coming from all over the city. There is even a report that Mousavi and Rahnavard have joined the protests (unconfirmed). If this is true it would be a major development. Keeping very close eye. Confirmed protests in Shiraz, Esfahan, and Tabriz. Trusted source says large crowds gathered near Amir Kabir University. Apparently opposition websites are now under cyber attack as Saham News has gone down. Getting reports that Mousavi and Zahra Rahnavard (his wife) are trying to leave their residence to join protests but being prevented from doing so by security forces. 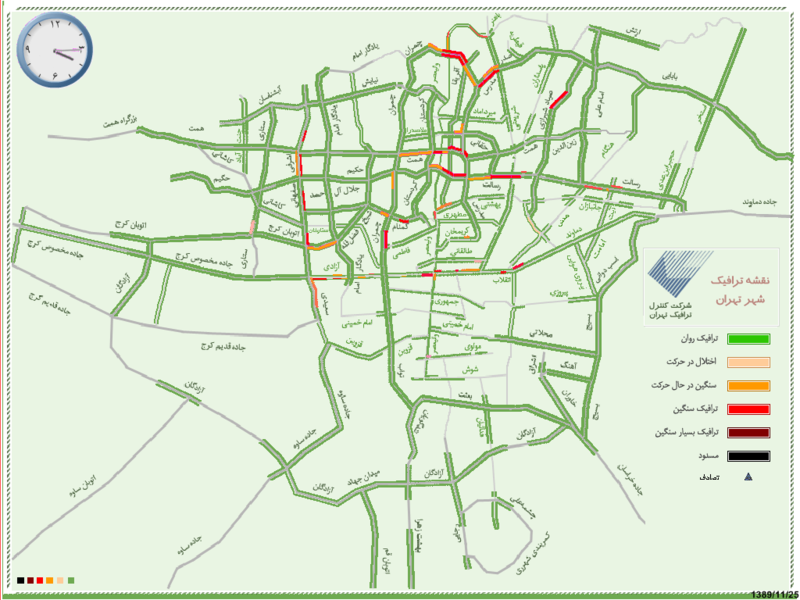 Tehran traffic map - red areas may be areas where crowds have gathered. Reports of clashes in various places coming in at a steady clip now. Still cannot confirm but keeping a close eye. Clashes at Vanak Square and Eskandari Avenue (unconfirmed). One source reports a massive sit-in at Imam Hossein square with no security forces in sight (unconfirmed). Also reports that SMS messages were sent to people before the protest to intimidate them. A video surfaces, filmed from a moving car, showing Basij on motorbikes in Tehran streets. The song playing in the background is a relatively new and popular song in the Iranian community. This video is almost certainly from today. At the end of the video a voice can be heard saying, “Careful, careful…” seeming to tell the other person in the car to be careful not to get spotted. We have our first report of clashes from trusted source, Mehdi Saharkhiz, who tweeted that there have been clashes in Valiasr Intersection, with tear gas used. Gul’s first official visit to Tehran coincided with a planned opposition demonstration, in support of popular uprisings in Egypt and Tunisia, which organizers hoped would revive Iran’s reformist “Green” movement. President Mahmoud Ahmadinejad’s government, which considers the Green movement “seditionist” after protests against his 2009 re-election, has not authorized the rally. At a joint news conference, both presidents spoke of their countries’ close relations, but Gul went on to comment on the rise of popular discontent in the Middle East. “My view is that what is happening should in no way be regarded as a surprise. In this age of communication, in an age where everybody is aware of each other, the demands and desires of the people are very realistic,” Gul said, in response to a question about the state of Middle East affairs. This is significant, especially given that it coincides with this planned day of protest. There was some confusion on the social networks earlier as to whether Gol had said that a permit for the rally should be granted and that he would like to march with the protesters. At this time we can’t confirm the veracity of this. But this statement above may be where the more exaggerated story originated from. One source reports that a huge crowd is moving from Ferdowsi Square toward Valiasr Intersection. Report from Tehran University are that security forces completely control the area. 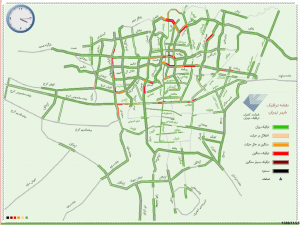 “There are dozens of police and security forces in the Vali-ye Asr Avenue … they have blocked entrances of metro stations in the area,” a witness told Reuters by telephone, referring to a large thoroughfare that cuts through Tehran. Another witness said police cars with windows covered by black curtains were parked near Tehran’s notorious Evin prison. Mousavi’s website Kaleme said security forces had set up a road block, refusing access to the opposition leader’s residence in southern Tehran. It said both mobile and landline telephone communications with Mousavi’s house were also cut. “It seems these newly-set restrictions are aimed at preventing Mousavi and his wife (Zahra Rahnavard) from attending the rally,” Kaleme said. Plain-clothes police stopped Rahnavard leaving the house, another opposition website reported. Chants of “Marg bar dictator” (Down with dictator) in Sadeghieh Square. Police still doing nothing to confront. One source reports seeing plainclothed agents carrying electric batons (treating this one with caution). More reports gathering of small crowds of people, 50 to 200 or so at a time, moving together towards various squares. Also reports of riot police in their riot gear mobilizing but not yet taking any action against the crowds. One source reports crowds growing at Sadeghieh Square, police are on the scene but only observing for now. Josh Shahryar reports that another source is claiming that security forces plan to come out in force at 2:00pm, an hour before planned protests. As the 3:00pm stated rally time approaches, reports coming in of police presence throughout different areas of the city. One trusted source reporting from the ground in Tehran says people starting to gather in the streets and in various squares, meeting no response from the police. Security vans moving towards Eghelab (Revolution) Square, and some 100 unarmed bikers moving towards Ferdowsi Square. About 50 riot police in Azadi (Freedom) Square. People are beginning to gather in Sadeghiyeh Square. A group of Tehran University students are gathered in front the university. Kalame reports that Mousavi’s residence is blocked off by police, leaving him effectively under house arrest. This meshes with earlier reports, and puts into question a later claim by a close advisor of Mousavi’s that he and Karroubi would both be attending the rallies today. For all intents, and purposes, they both appear to be under house arrest at this time. Source of pics is Mardomak. Ask your friends to ask Wael Ghonim to support Iranian Green Movement protestors on Monday! The Islamic Republic of Iran Broadcasting (IRIB) is down – quite possibly hacked, as hackers have targeted regime sites on days of protests in the past. Rahesabz reports that Arjomand has said that both opposition figures, Mir Hossein Mousavi and Karroubi, will be at today’s rally. This conflicts with the multiple reports we have seen indicating that both of them are under house arrest or at least severe restrictions. We will continue to monitor this closely. The U.S. State Department has launched a Farsi language twitter feed, @USAdarFarsi, obviously intended for Iranians inside and outside of Iran. (1) The Department of State recognizes the historic role social media plays in the lives of the Iranian diaspora. We want to participate in your conversations. (2) By not issuing a permit for a rally to the opposition, the government of Iran showed that the activities that Egyptians took part in and which it praised, it consider illegal for its own citizens. (3) White House: The US wants Iran to give its people the same rights that were given to people in Cairo: to peacefully assemble, protest and express themselves freely. Iran’s Supreme National Security Council has signalled that should pro-opposition protests break out on Monday, Iran’s security and military forces must avoid direct confrontation with Green Movement protesters. According to a source close to the Green Voice of Freedom, the most recent meeting of the Supreme National Security Council of Iran was concluded with no clear consensus on how best to treat the upcoming opposition protests on Monday. Nevertheless, it’s become apparent that Iran’s ruling elite are deeply concerned that a fate similar to that of the Egyptian regime might be awaiting them too. Reports suggest that figures in the Revolutionary Guards Corps, an elite fighting force heavily invested in suppressing the 2009 post-election protests, are alarmed by a possible loss of faith and confidence among the IRGC’s middle-ranking commanders as well as the prospect of soldiers disobeying the orders of superior officers on Monday. During the SNSC meeting, the commander of the IRGC suggested that his forces would maintain a less visible presence in Tehran on Monday and that the country’s riot police would be charged primarily with controlling the street protests in the country’s capital. According to the proposal put forth by the IRGC, in the event that the police are unable to cope with magnitude of demonstrators, the IRGC will take a more active role in controlling the crowd. Many Iranians, specially activist of the Green Movement, wish that you write an statement in support of the Green Movement. Today, many of Iranians want to participate on a demonstration in support of democratic movements in north Africa, e.g. Egypt. This could also cause a rebirth of the Green Movement. Iranian government refused permission to hold a rally on February 14. By writing a statement, you not only could make the Iranian people happy, you would also make it harder for the Iranian regime to suppress the demonstrations. The worldwide press is watching Egypt. Your words mean a lot to us. Sardar Naghdi, Basij leader, promises cash payments to Basiji members who can dare to confront and attack not only ordinary people on the street but their own neighbors and family members who support the Green Movement. Also, he mentioned a medal of Hezbollah for anybody who can perform the act of attacking his own close neighbors, brothers or even his own father. This is just a day before the 25th of Bahman support for Egyptian people by Iranian counterparts. 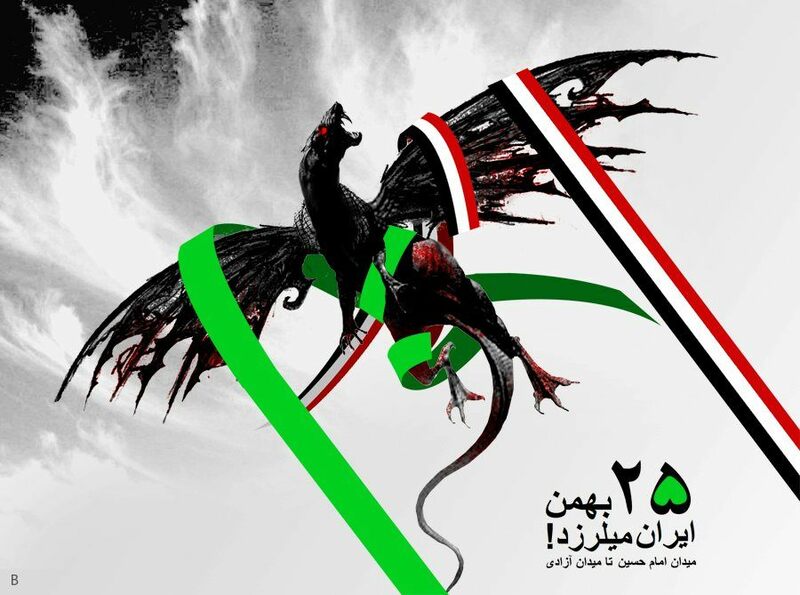 The Coordination Committee of the Green Path announced that all Iranian people who participate in the 25th of Bahman must remain calm and not let the attacking group to infiltrate the peaceful gathering of this day, by being vigilant and alert. An advisor to Karroubi announced that we do not need any permit from the authorities for the gathering of 25th of Bahman since this covered in our constitution and the ministry of internal affairs is responsib;e for the safety of the Iranian citizens who participate in this gathering. Majority of universities and higher education institutions in Iran have already announced that they will participate in the 25th of Bahman gathering of support for Egyptian people and celebrating their success of toppling a dictator. A wave of arrests has already taken place in many parts of the country in advance of the 25th of Bahman. A group of the student of the City of Ghochan University were arrested today in the city of Mashad. Mesbah Yazdi (extreme hardline cleric) announced that Hashemi Rafsanjani liked to see the arrests ot Karroubi and Mousavi in order to save himself from being labeled as opposition. Also, he said Rahim Mashaie (a key advisor of Ahmadinejad) is with Rafsanjani and he would hurt Ahmadinejad. The website associated with Mir Hossein Mousavi, Kalame, reports that last night chants of “Allah-o-Akbar” were heard not only in Tehran but in many other major cities throughout Iran. BBC Persian has reported that a senior advisor to Mir Hossein Mousavi, Ardeshir Amirarjmand, has informed them that the lines of communication with Mousavi have been cut and that he is not reachable. Clearly the regime is very worried. On February 11, just before Hosni Mubarak stepped down as President of Egypt, Mehdi Karroubi, one of the lead opposition figures, was put under house arrest. All communications with him, including his mobile and land lines were cut. At the same time, there were reports of a media blackout as virtually all externally broadcasted satellite news feeds into Iran were jammed, while simultaneously Internet connectivity was rendered virtually non-existent or extremely slow. For all intents and purposes, it looked like the regime was attempting to keep as many Iranians as it could in the dark about what was happening in Egypt (as it was very inconvenient to be holding celebrations for the 32nd anniversary of the founding of the Islamic Republic when another 30 year dictatorship in the middle east was coming to an end). The regime also was trying to prevent any news about the situation within Iran, except for its own propaganda of a strong regime celebrating its own hubris, from getting out. The tweet quickly went viral with hundreds and hundreds of retweet, as world attention on the situations within repressive Middle Eastern regimes is high. We will be live-blogging events in Iran and around the world today as anticipation mounts for what is shaping to be another historic day of protest in the nation–the nation that following a heavily disputed presidential election in 2009, began the trend of uprisings against tyranny and dictatorship that we have been witnessing across the entire middle east. In 2009, following the presidential election (with immediate and mounting evidence of widespread fraud and vote rigging) people poured into the streets in a spontaneous protest against the injustice of a rigged result that handed the election to the incumbent and controversial Mahmoud Ahmadinejad. A peaceful protest of millions of people asking, “Where is my vote?” was brutally attacked and suppressed by a merciless, ruthless regime. Over the course of many protests and months, hundreds (possibly thousands) were killed, thousands were imprisoned and brutalized, raped, tortured and humiliated in the name of a regime that sees itself as the representative of God on earth. Last February, during the 31st anniversary of the founding of the Islamic Republic, the regime was able to frame the story to their benefit by preventing the thousands that showed up to protest against them from coalescing into a visible, organized protests. They were able to do this by spending hundreds of millions to bus in and pay for hordes of paid goons, regime loyalists, revolutionary guards, mercenaries and volunteer Basij to flood the streets of Tehran. Many proclaimed this to be the death knell of the movement for liberty, fundamental human and civil rights and justice that had formed in reaction to the regime’s hubris and brutality. Since then, while there have been days where the people have shown their opposition to the regime under no uncertain terms, the regime has been able to largely keep the story from getting out that the movement is alive. But after the revolutions that we have witnessed in Tunisia and Egypt, the people of Iran are once again emboldened. The opposition leaders, Mir Hossein Mousavi and Mehdi Karroubi have called for protests in Iran in solidarity with the movements for freedom and against tyranny in those countries. We have been witnessing these calls morph into a renewal of the demands of the Iranian people for their own freedom now. The day for this protest call is upon on us. It is now just after midnight, Tehran time. Stay tuned as we monitor the events and report on them here. For a good synopsis of how we got here, read Iran 101 – Post #IranElection, by James Miller of Dissected News. Tomorrow we will reach Azadi Square. Despite heavy Police Force. We will break through. But now we lay down our heads and rest. Tomorrow it will be the beginning of the end of the Iranian Government. How non-violent is this expected to be? I think you may have to consider strategic action against the “hands” of the regime. Keep up the good work. 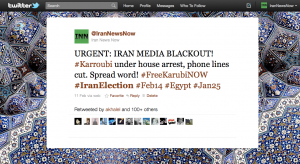 Spread all news about what’s going on, everybody is desperate for news whether in Iran or abroad. Iranians living abroad wish they could join you in the flesh, but we can’t do anything but join you in the heart! I have so many Persian friends who were behind me in our revolution in Egypt. Just want you to know that we are behind you 80,000,000%… May god protect you all and be with you always. Long Live Freedom.